So the last two posts covered a quick intro and a great view on the Corporate Information Factory. 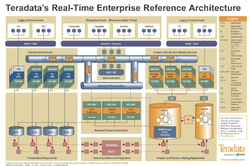 Today I want to open up for discussion Teradata’s Real-Time Enterprise Reference Architecture which is an article that Todd Walter wrote for Tech2Tech. I have seen and been a part of this architecture and even have a presentation in my kit bag, but this article does the architecture proud. This is an interesting architecture which is a bit to complex to be viewed as a Business view reference architecture, but it is Teradata’s. I finally had a great insight into the architecture when listening to Stephen Brobst explain it about a month ago. So I want to take that insight and some of my thoughts and see if we can make this a little less daunting. I was really entranced by the Event driven notification and business processes in conjunction with the application integration. This is where you get the secret sauce of active data warehouseing – the feedback of realtime information to operational systems. This is often overlooked and if you look closely at how Todd lays this out he subtly makes this closing of the loop look so easy – which it can be. Transactional Services – these are your operational and functional systems which the people who operate your business use. Also often referred to as the systems of record for your origination of data. This could be a call centre application, CRM, billing system, call detail record, finance and the list goes on. Analytic and Decision Making Repositories – Holding your historical data this can take a wide variety of forms. This can be physical or virtual within the Enterprise Data Warehouse (EDW), but often is the operational data store. Data Acquisition and Integration – This is our collector of data from all sources in or outside the organization which moves data into the Decision Making Repository. Classically this has been the extract transform and load (ETL) process, but with the evolution of tools and the move to active/real-time data, you now have ELT, as well as leveraging messaging in the form of Enterprise Application Integration (EAI). Transactional Services – transactional systems that focus on a narrow set of business processes. These can be published as Services (SOA) so can be consumed by anyone or any other system. Analytic and Decision Making Services – Services that provide both Strategic and Tactical broad-based intelligence and once again are also systems. These could be category management, inventory or front-line service rep systems. Enterprise Message Bus and Service Brokers – This is the glue that allows the closing of the loop to all the systems. These are classicaly EAI, Web Services, and many other forms, but we are sharing and dispersing our data across this platform as it happens and on demand consumption. Enterprise Users – Browsers and / or Portal – These are the ways that users interact with our data in a direct manner either through portals or online applications anywhere, anytime on many devices. Legacy Environment – how do you evolve and include these applications because they are not going away. These need to be included and integrated leveraging many different tools such as EAI. There are diamonds in these fields, they just need to be mined. Business Process Automation – This is an evolving area, especially with the evolution of Enterprise platforms such as BEA, SAP and others where we are creating business process automation and integrating exception initiation, detection, filtering and propogation. This gives operational people the information they need as it is evolving. EDW-A and EDW-B (Dual Active) – this is the platform to create business critical reliability to the structure. In most cases Teradata is not known to have problems, but once this becomes operational we need a structure to guarantee our uptime and availability. These are my thoughts about building the Teradata diagram into the bigger whole. From there we have a very technical overview, but if you simplify the content into these 10 boxes, you have created more of a reference architecture.